The roots of the Empkie Family Tree in America begin with Carl Johann (Charles) Empkie (b. 1813, d. 1899). Charles emigrated to Hume Township in Huron County, Michigan in 1857. He was born in Prussia (Germany) along with his wife, Sophie (Wiegart) Empkie and their son Frederick Empkie (b. 1850). Charles and Sophie farmed land in Hume Township - they had some livestock and also grew oats and had an apple orchard. Frederick Empkie (b. 1850) established the Empkie Farm on the land where it still is today in 1868. In 1880, he married his wife Mary and they built the original farmhouse. At this time, the farm was mainly a cash-crop farm - growing wheat, beans, and oats. There were also beef cattle and other small livestock on the farm. Frederick and Mary had seven children together - Emma, Fred, Lavena, William, Richard, Walter and Loretta. Fred Empkie Sr. was the eldest son born to Frederick and Mary in 1883 (d. 1961). He would later marry Annie (Damrow) (b. 1890, d. 1977) and the two would continue to farm the Empkie land. Fred Sr. and Annie built the barn that still stands on the property in 1930. The farm continued to produce cash crops and started raising dairy cattle in 1950. Fred Sr. and Annie had two children - Vera and Fred Jr.
Fred Empkie, Jr. and his wife Ann Hercliff on their wedding day in 1949. Fred Empkie Jr., born 1930, continued to raise dairy cattle and cash crops on the Empkie Farm. The cattle numbered at about 50-60 at any given time, with about 20 dairy cows. He married Ann (Hercliff) (b. 1932, d. 2005) in 1949. Fred Jr. and Ann had two children - Linda and Paul. Paul Empkie, born 1955, is now the head of the Empkie farm. He married Nancy (Parke) in 1981. Together, Paul and Nancy have continued to grow cash crops - wheat, dry beans, and soybeans. In 1993, they sold the dairy cattle and that was the same year they began to grow Sweet Corn for sale. They have three children - Scott, Jennifer and Brian. Jennifer, Brian, and Scott Empkie husk Sweet Corn - just the beginning of the thousands of cobs husked over the years! 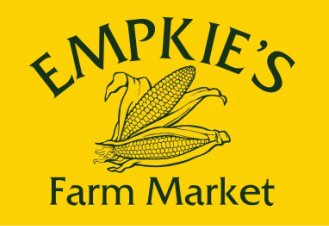 The family is still located on the original farmland owned by Frederick Empkie. In 1981 Paul and Nancy built their home on the place where the original 1880 farmhouse once stood. In 1993, Paul and Nancy Empkie began to grow Sweet Corn to sell at the roadside. It was a very small operation in the beginning. We picked the corn into 5 gallon buckets and then packaged them into bags by the dozen and half-dozen. Our first "market" was the tailgate of the pickup parked in front of the shed. Brian & Jennifer Empkie and their cousins - Stephanie and Paul Hayes, 1993. The beginnings of Empkie's Farm Market. As the popularity of the Sweet Corn grew, we branched out into growing other vegetables - tomatoes, cucumbers, zuchinni, melons. The number of items grown has changed over the years , but our Sweet Corn has always been our staple product. In the past few years, we've started producing our Frozen Sweet Corn and Salsas, and we look forward to continued growth in the future. The Empkie Farm in 2004. We're proud of our heritage and we look forward to celebrating the farm's sesquicentennial (150 years) in 2018. We're happy to share our love of land and farming with our customers and hopefully, generations of Empkies in the years to come.